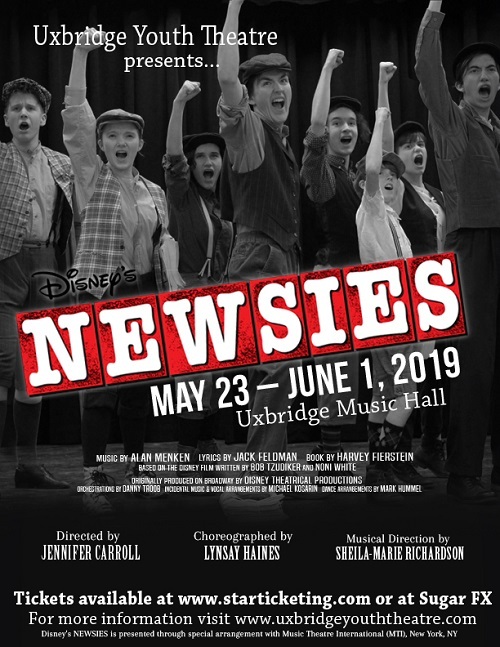 Uxbridge Youth Theatre is proud to present NEWSIES. Set in turn-of-the-century New York City, Newsies is the rousing tale of Jack Kelly, a charismatic newsboy and leader of a band of teenaged "newsies". When titans of publishing raise distribution prices at the newsboys’ expense, Jack rallies newsies from across the city to strike against the unfair conditions and fight for what's right! Based on the 1992 motion picture and inspired by a true story, Newsies is a show packed with non-stop thrills and a timeless message, perfect for the whole family and every audience. Tickets are $25.00 for Adults and $20.00 for Students. Ticket prices include all taxes, ticket fees, and Music Hall Improvement Fund.